If you’ve obtained source code from an academic lab that was last developed some time ago and you spent a whole day installing libraries and symbolic links and redefining variables in your .bashrc and downgrading libraries and redefining paths and have 20 tabs open in your browser that all go to 20 different obscure error discussions on Stack Overflow and it’s late and you’re tired and you think you might not need the program after all if you do a bunch of other workaround things instead – what’s below is for you. Academics have been developing small code for (nearly) millions of years to make their lives easier – and we all benefit when that code is made available to others (esp. when it helps in data analysis). When that code is a series of perl or python scripts, there’s generally little reason why you should have any run issues. When they call on external libraries or specific tools, generally that information is available in the README somewhere. Generally speaking, there’s no reason why a code shouldn’t work in a straightforward manner when the developer doesn’t make it known that something else needs be installed to make it work. So, why doesn’t code A work on your linux box? A few possibilities. 0. You didn’t read the README right. 1. The developer skipped some documentation and you’re missing a library or program that they installed months earlier but forgot about (and they forgot to acknowledge that that was a needed item to run their program). 2. Your linux distro is too new, they developed it on something much older, have never updated their own machine, and something fundamental changed between, for instance, Ubuntu 8.04 and 14.04 (I’ve run into a few in that category – depending on the code, this can sometimes just be chalked up to a compiler difference issue that went unnoticed by the developers). 3. The one you learn the harder way – Ubuntu is not Fedora is not OpenSuse is not [insert distro here]. Half of the Ubuntu posts on this website stem from my having needed to do something under Ubuntu to make it look a little tiny bit more like whatever distro a developer developed their code with. Let’s hammer on point 3 for a minute – I know precious few academics who use computers as part of research who are both (1) experts in coding and (2) experts in interpreting the output of some code. A properly working code in the hands of a productive researcher can mean the difference between an OK interpretation of data and a very descriptive interpretation of data that anyone else could follow (which, let’s not lie to ourselves, may also mean the difference between a journal with an impact factor of 0.5 and one of 5.0). Disregarding any “it was hard to code, it should be hard to use” mentality, finding out that a program runs painlessly on distro A with NO effort after trying in vain on distro B with CONSIDERABLE effort is a rather important piece of information. For the record – this isn’t about a user’s ability to program, install, admin their machine, etc. It’s simply about ease-of-use for ALL users regardless of their computational aptitude (which is why many of the Ubuntu posts on this website are exhaustive in their reporting of errors as well as work-arounds). Which brings me to one of the most versatile (and storage-consuming) programs on my Ubuntu 14.04 machine – VirtualBox. VirtualBox (and related) are absolutely awesome for their abilities to let you try – very quickly – the quick fix that is the building or running of a strange code “somewhere else.” For the record, I ALWAYS try something new using a clean Ubuntu 14.04 image under VirtualBox before I ever let it touch my main machine – and that’s because I’ve had more than one instance in the past of trying to build a piece of software that then destroyed (well, sort of) my machine. When you destroy an image with a bad installation attempt – all you have to do is trash the image and copy a fresh one over from some “clean image” folder. Could not be easier. Furthermore, I’ve still ONE app that works in Windows XP that doesn’t work anywhere else. And I’ve two or three under Windows that I use generally – all ready for use under VirtualBox without having to reboot anything. Additionally importantly – Virtual Machines allow you to “sample in time” – working around new & improved features and functionality in new compilers and libraries by instead building code on what was available at the time of the code’s release. Sample output (from a successful Gaussian09 benzene tutorial run). The “density of delocalized electrons” is a concept that is intuitively used to explain the electronic structure of conjugated systems. Unfortunately, however, there is no rigorous way to separate the total electron density in a density of localized and delocalized electrons. Like aromaticity, bond order, point charge, and other important concepts of chemistry, a definition for the density of delocalized electrons has to be derived from more fundamental quantum theoretical parameters. As observables, magnetic properties are a suitable starting point for a general description of of delocalization and conjugation. In analogy to the anisotropy of the magnetic susceptibility, which is a powerful measure of aromaticity, we investigate the anisotropy of the current (induced) density (ACID). Similar to the square of the wavefunction which defines the total electron density, the ACID scalar field defines the density of delocalized electrons. The ACID method proved to be an extremely versatile and descriptive tool to analyze delocalization in ground-state molecules, excited states, transition states, organometallics, hyperconjugation and other through-bond and through-space interactions. Having spent quite some time determining the best way to account for electron delocalization in an upcoming project, the ACID method (“Delocalization of Electrons in Molecules,” J. Phys. Chem. A 2001, 105, 3214-3220. dx.doi.org/10.1021/jp0034426) struck me as near-ideal, leading to my request for the code from the developers. With the code graciously provided, my first run attempt under Ubuntu 14.04 (and Cygwin, and Ubuntu 10.04 because it was waaaaay back when) went less-than successfully after the successful Gaussian run. Warnings are not errors, so meh. Google searching indicated a code issue (version issue) that someone on Stack Overflow proposed fixing by turning off optimization (removing -O2 from the Makefile). The error goes away. And the tutorial run output itself is below – complete with error. Cube-file wird geschrieben. Bitte warten. Es wurden 2604 Pfeile generiert. Davon zeigen 1302 in die Isooberfl?che hinein (50%). Dreiecke werden generiert. Bitte warten. Povray-input wird geschrieben. Bitte warten. ...and read 24 bonds into memory. Wrote 0 single, 12 double, 0 triple, 0 higher order, and 0 hydrogen bonds. Copyright 1991-2013 Persistence of Vision Raytracer Pty. Ltd.
OpenEXR, Copyright (c) 2004-2007, Industrial Light & Magic. Image resolution.....1024 by 768 (rows 1 to 768, columns 1 to 1024). Parse Warning: No objects in scene. presence of a #version statement mandatory. … sends you to, among other pages, one Stack Overflow discussion that starts with the error and ends with recommendations of finding a good debugger – not something I’d any interest in pursuing as part of getting this code to work. I did not find any version-dependence discussion with the errors above, but opted to try using an older gcc – that I wasn’t about to install on my new Ubuntu box. Ergo, find an older distro that installs an older gcc. I threw it on an OpenSUSE 11.2 image because the developer group is in Germany – that’s basically why – and because I couldn’t find an old enough Ubuntu distro that would update/upgrade/install apps from the current repositories. The build process then goes as follows – with no issues. Weder benzol.nmr.icd40000 noch benzol.nmr.icd40000.gz existiert. Weder benzol.nmr.icd noch benzol.nmr.icd.gz existieren. Es wurden 84726 Stromdichtetensoren eingelesen. Davon zeigen 1302 in die Isooberflâ€°che hinein (50%). The POV-Ray Team(tm) is not responsible for supporting this version. Copyright 2003-2004 Persistence of Vision Raytracer Pty. Ltd. Image resolution 1024 by 768 (rows 1 to 768, columns 1 to 1024). require semi-colon ';' at end. user manual regarding changes in POV-Ray 3.5 and later. Producing the beautiful and informative image shown above (despite the Parse Warning and Possible Parse Errors above). For the record, compiler version differences can be subtle beasts – and my whole discussion above is not directly related to getting ACID to work. The above is a mix of brute force and resource consumption that provided a much faster turnaround in positive results than any amount of work spent in Ubuntu itself to make ACID run successfully – and does not require modifying anyone’s code (an added bonus for those who might have to ask questions of the developers). So, I would posit that the issue turns out to be a 4.5 vs. 4.8 thing, but I’ve not explored the issue further (frankly, no time – and it’s working – so I don’t know at what point in gcc development that the make process began to produce errors in the ACID code). This isn’t technically the way to run it natively in Ubuntu, but is a way to get it to run in Ubuntu, which still counts in my book. In theory, a VirtualBox install and some book work on finding the dates of certain distros provides yet another way of getting stuff to just work. That said, getting OpenSUSE to play with the Networking in VirtualBox appears to be a real pain. My solution for that for getting files back-and-forth to process? Two issues (one easily addressable, one only by external workaround) related to the prediction of Raman intensities in Gaussian09 – for which there’s next-to-nothing online to address either of them (likely because they don’t come up that often). Minotr:  UHF open shell wavefunction. Differentiating once with respect to electric field. with respect to dipole field. Electric field/nuclear overlap derivatives assumed to be zero. Requested convergence is 1.0D-08 RMS, and 1.0D-07 maximum. Secondary convergence is 1.0D-12 RMS, and 1.0D-12 maximum. NewPWx=F KeepS1=T KeepF1=T KeepIn=T MapXYZ=F SortEE=F KeepMc=T. MDV=    3932153962 using IRadAn=       1. 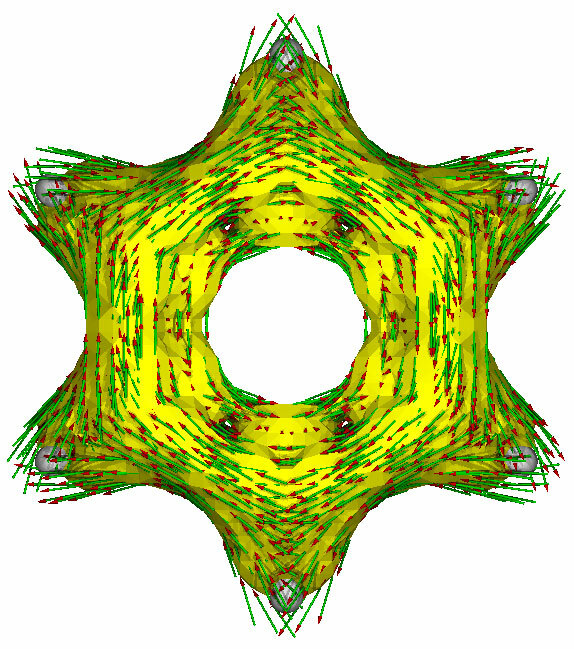 Generate precomputed XC quadrature information. Solving linear equations simultaneously, MaxMat=      72. There are     3 degrees of freedom in the 1st order CPHF. IDoFFX=0 NUNeed=     3. 3 vectors produced by pass  0 Test12= 3.94D-11 3.33D-08 XBig12= 2.15D+05 2.71D+02. AX will form     3 AO Fock derivatives at one time. IRaf= 160000000 NMat=   3 IRICut=       1 DoRegI=T DoRafI=F ISym2E=-1. Petite list used in FoFCou. 3 vectors produced by pass  1 Test12= 3.94D-11 3.33D-08 XBig12= 1.52D+04 3.94D+01. 3 vectors produced by pass  2 Test12= 3.94D-11 3.33D-08 XBig12= 1.29D+04 3.31D+01. 3 vectors produced by pass  3 Test12= 3.94D-11 3.33D-08 XBig12= 1.65D+06 4.27D+01. 3 vectors produced by pass  4 Test12= 3.94D-11 3.33D-08 XBig12= 1.92D+08 6.96D+02. 3 vectors produced by pass  5 Test12= 3.94D-11 3.33D-08 XBig12= 4.40D+10 7.74D+03. 3 vectors produced by pass  6 Test12= 3.94D-11 3.33D-08 XBig12= 4.42D+12 1.70D+05. 3 vectors produced by pass  7 Test12= 3.94D-11 3.33D-08 XBig12= 3.50D+14 1.14D+06. 3 vectors produced by pass  8 Test12= 3.94D-11 3.33D-08 XBig12= 3.13D+16 1.34D+07. 3 vectors produced by pass  9 Test12= 3.94D-11 3.33D-08 XBig12= 1.75D+18 4.02D+07. 3 vectors produced by pass 10 Test12= 3.94D-11 3.33D-08 XBig12= 1.28D+20 7.81D+08. 3 vectors produced by pass 11 Test12= 3.94D-11 3.33D-08 XBig12= 1.50D+22 7.70D+09. 3 vectors produced by pass 12 Test12= 3.94D-11 3.33D-08 XBig12= 1.12D+24 5.57D+10. 3 vectors produced by pass 13 Test12= 3.94D-11 3.33D-08 XBig12= 2.86D+25 5.87D+11. Error termination via Lnk1e in /opt/g09/l1002.exe at Sat Oct 11 01:10:22 2014. What little there is available online for the “OrtVc1 failed #1.” error (from CCL – here and here) is less than helpful in addressing the problem. The problem is also coordinate system-independent (Cartesian and z-matrix formats both provide the same error), but is sensitive to the choice of basis set (6-31G(d,p) would work fine through the Raman intensity predictions, 6-311G(2d,p) would fail at the stage above). Directing the issue to Gaussian, the provided workaround is straightforward. The prediction of Raman intensities requires using Coupled Perturbed Hartree-Fock (CPHF), for which a special sensitivity in the code (currently) exits when using both molecular symmetry and the fast multipole method, the use of which (FMM, that is) is governed by Gaussian09 based on the atom count. 1. The first stage contains no Raman keywords (just the plain “freq” call). 2. In the second stage, the cphf=rdfreq is reading an incident light frequency of 0 (cm-1 or nm) at the bottom of the input file (“0”). You can run the static or dynamic cases as you like at this stage. 3. Also in the second stage, FMM is turned off (nofmm). 4. Also still in the second stage, the option to calculate Raman intensities is turned on (polar=raman). This is, as it happens, a recommended way to perform Raman intensity calculations – run a typical normal mode analysis, then import the force constants (and geometry) from this calculation into a Link1 step while increasing the basis set size (for better intensity prediction). In theory, your calculation should run just fine. The next problem is GaussView-specific – one that only comes up when you’ve a system with dynamic polarizability (incredibly long polyenes being a prototypical example) or when you perform frequency-dependent Raman calculations and you slip near resonance. When running a series of Raman intensity calculations with increasing incident light frequency (cphf=rdfreq, then an array of energies), Mode 17 of this particular molecule either has a really large activity (cannot be printed out) or we’re approaching resonance (also a case of really large activity and it can’t be printed out). This isn’t a problem with the code, it’s your molecule. This is all well-and-good if you only rely on the .log file. If you skip the .log file inspection and only ever use GaussView, the result of inspecting the Raman intensities is below. 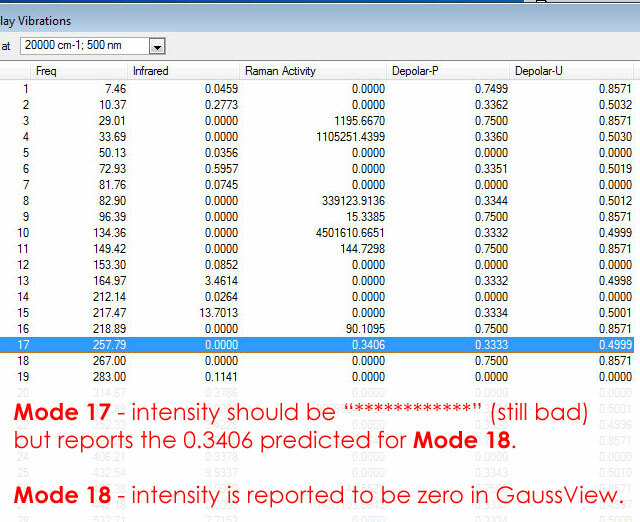 Note that Mode 17 has the intensity of Mode 18, and Mode 18 has zero intensity. Something is afoot! If you know what to expect out of your system, the missing intensities should be obvious. If not, you’re missing some very important information about your molecule. The GaussView developers are aware of the problem. In the meantime, you can get around this problem by globally replacing all of the ” ************ ” (note the spaces on either side!) with a huge number (at which point the Raman intensity issue will become obvious – careful to preserve the spacing in the .log file).